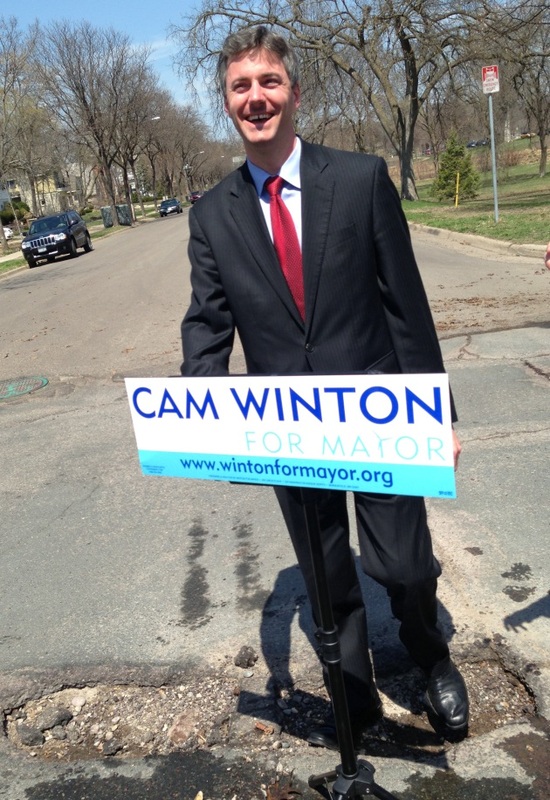 Mayoral candidate Cam Winton took his campaign to the streets -- literally -- on Monday, highlighting a pothole in southwest Minneapolis as an illustration of the city's poor street conditions. The pothole press conference, which occurred in the middle of an intersection, fell within Winton's campaign theme of improving core services and reducing city spending on what he dubs "bells and whistles." Winton, an independent, is currently the only non-DFLer waging a substantial campaign for mayor. After a social media push to find the city's "worst pothole," it was Winton's wife who spotted the doozy on West 38th Street and Zenith Avenue South (see picture below). Winton stood in it at the outset of his press conference. The city boosted spending on road repairs several years ago, but for years the Pavement Condition Index continued to fall (see May 2012 graphic below). It was 70 in 2010, down from 82 in 1995. Things appear to be stabilizing, however. The PCI has stopped falling and a city official said recently that this is the second consecutive spring of better-than-normal pothole numbers. Winton maintains that the figure should be closer to 80. He said city funding is too sporadic, noting that budget documents project that bonding for street repairs will fall from $22 million in 2013 to $8 million in 2017 (see page 19 here). He thinks it should be about $20-25 million annually. Total street repair spending, which includes state and federal dollars, is expected to fluctuate up and down during the same period (see page 15 here). But how would he pay for it all? Winton listed a couple of targets for spending cuts, some of which could pose logistical hurdles before they get translated into cost savings. He wants to cut bike trail, public art and energy conservation spending, as well as merge a variety of back-office services with Hennepin County. Most of the plan relies on the city-county mergers, which could include the city renting 911 services, Winton said. Just what services would be merged (Winton mentioned IT, human resources and procurement) and whether the savings would materialize remains unclear. Winton said he would challenge department heads to find $15 million in savings. Cutting public art, meanwhile, would only free up between $400,000 and $600,000 annually in the city's budget. Winton conceded that public art spending is small-bore, but "it would not be intellectually honest to look at the way we're spending our capital funds and not note that we are spending that money on public art." UPDATE: For the curious, here is Winton's own breakdown (via e-mail) of some of the potential cost savings from city-county shared services. - Currently, city spends $99 million year on the basic structure of its service-delivery platform. http://www.minneapolismn.gov/www/groups/public/@finance/documents/webcontent/wcms1p-103502.pdf, page E4. - Spending on City Coordinator's office -- which "[i]ncludes Human Resources, Finance, 311, Intergovernmental Relations, Communications, Neighborhood and Community Relations, IT, 911 and Emergency Preparedness" -- constitutes 8.3% of the $1.2 billion budget. 8.3% of $1.2 billion = $99.6 million. - City could save money by paying Hennepin County to provide some of those services -- similarly to how Minneapolis and Hennepin County now collaborate on libraries, and the way St. Paul and Ramsey County collaborate on some services. - For a sense of scale: city has approx. 4,500 employees. County has approx. 8,500 employees. Finding way to eliminate even just 100 positions (by not filling positions as people retire -- NOT by lay-offs) x $100,000/position/year (rough estimate of salary + benefits) = $10 million/year. - I would challenge dept. heads to find $15 million in savings/year.